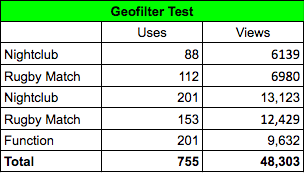 The potential and reach of Geofilters is grossly underestimated. They can be accessed in most locations across the globe but earlier this year, users in the US, UK, Canada and Australia were given the opportunity to create their own filter for personal or business use. Anyone who wants to advertise their business has potential to utilise this underpriced yet powerful tool. It was only in May this year that Australians were able to start using the tool. So during the first week in Australia, I mocked up a few designs over Photoshop and testing some venues where I thought people would be using Snapchat. I don’t want to offend your eyes with how terrible my Photoshop skills are, however I was an early mover so quite a few people used my filters. However bigger brands with large budgets are starting to use them, so I would highly recommend investing in some good design and identify where your ideal customer will be during your geofilter setup. Understanding the consumer behaviour of Snapchat users (or for any platform) during the weekdays/weekends is essential to your Geofilter strategy. The key here is to invest time and effort to make the filter fun, creative and playful. From a user’s perspective, we don’t want to snap a filter with too much branding. We want to share fun content with our friends. So for businesses that can correctly execute the creative and strategy, there is a huge opportunity. The potential to showcase your brand to thousands of potential customers for a small price is very valuable. People will start to recognise that your brand is fun and engaging, leading them to check out your website. At the moment, the market is not too saturated so there is still a lot of room for testing and optimising your results. — Spending time on the creative and strategy is the most important aspect when it comes down to Geofilters. However, it should be noted that Geofilters are not enough — the biggest investment a brand can have is incorporating them within their Stories and tell a compelling story. Nail this and you will be increase your brand equity and interact with your consumers on a whole new level. Tom Terado is a Snapchat Enthusiast. For more posts on Snapchat and how businesses can utilise it, visit theyellowghost.com 🙂 Follow him on Snapchat at: tterado.